Aloha! At last my 6 week fury of 9am til 9pm work marathon, everyday including weekends, has come to an end (I also had Appendicitis, which was fun). I finally have some free time to work on that new FofR Configuration, I have some interesting ideas to try out. In the mean time, our beloved PanelsUI component continues to improve through Terrestrial’s efforts. In the last Panels post I said the URL never changes, turns out Terrestrial changed ISP and my notion was shot to pieces. So we have an all new download URL, aren’t these things exciting? 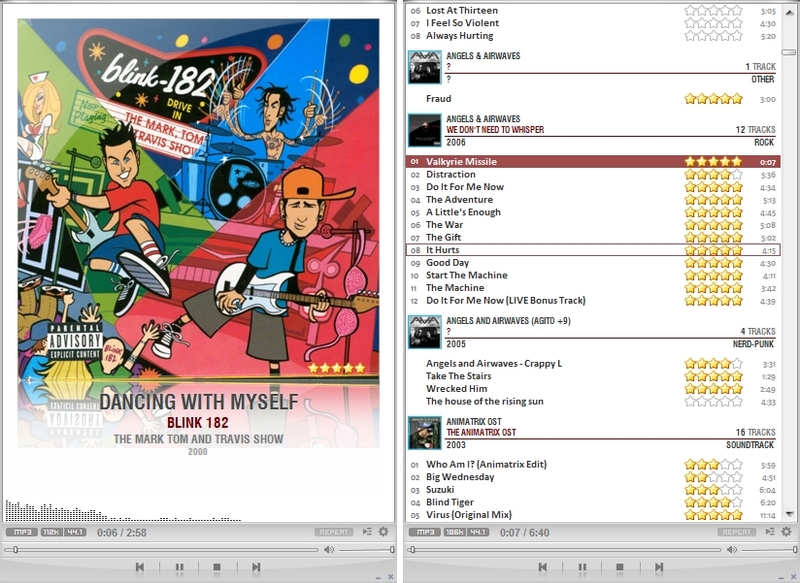 A quick access playlist in the Now Playing tab, I am using this a surprising amount to quickly change track, etc. You may also notice a new blue theme. There’s also some new quick image options. Note, the extra tabs are just me playing around. - Columns UI Updated version!!! Unzip images in your foobar install folder (C:\Program files\foobar2000). Be sure you get this folder: C:\Program files\foobar2000\dark1. If you get C:\Program files\foobar2000\dark1\dark1 or C:\Program files\foobar2000\images\dark1 folder then the skin won’t work. You must to set the images folder if you want to use your own images location). Terrestrial has been hard at work developing the PanelsUI component we have all come to know and love. With these two updates come a number of interesting changes. The most significant of these are the ability to pop-up a new panelsUI window, the second is an inbuilt PanelsUI compatible Library Filter panel. The new reset option makes installation of configurations that use defaults much easier also. New “Library Filter” panel. a bit similar to Album List but with the ability to “and” and “not” nodes. also uses the current scpl sort/group settings when sending to playlist. use the sample “library.pp” layout file with a POPUP: to see how to customize. New “track globals” which are also evaluated before sorting/grouping. Keep this small and fast. New button POPUP:”layout file” to create a new panels ui window. Download PanelsUI Version 0.12 – does this URL ever change? Something to note, there is an additional .dll file in this installation that must be placed in the fb2k directory NOT the components directory. This is to help prevent a number of crashes that some users were experiencing. Well, now that I have had a few moments of free time I have been able to finalise my latest layout release. I know this has been anticipated by many, particularly with the PanelsUI v0.9 and v0.10 incompatibilities of ye olde version 0.6. Browse Panel: Explorer Component replaced with CWBowron’s Playlist Tree (may be buggy installing/using with PanelsUI – works good here). Sort Panel: Main Menu/Edit/Sort By/ Menu items apply a sort preset then sort accordingly so as to display correctly. Mini Mode: Click the triangle in the bottom left to go into a mini player/browser, click it again or the title to return to the previous window size, old tab/mode saved and reverted back to also. Ratings: Added VA “ALBUM ARTIST” tag to ratings panel to allow easy marking of various artists albums (tags with content of %composer% or as ’1′ if no composer exists, %composer% comes from the NOW PLAYING or SELECTED track depending on the mode of the panel). Ratings: Added “Remove Buttons” for VA tag, Playcount and Ratings (resets them, if you make a mistake). Config Panel: Change Size of Now Playing Art when art is not scaled to fit. 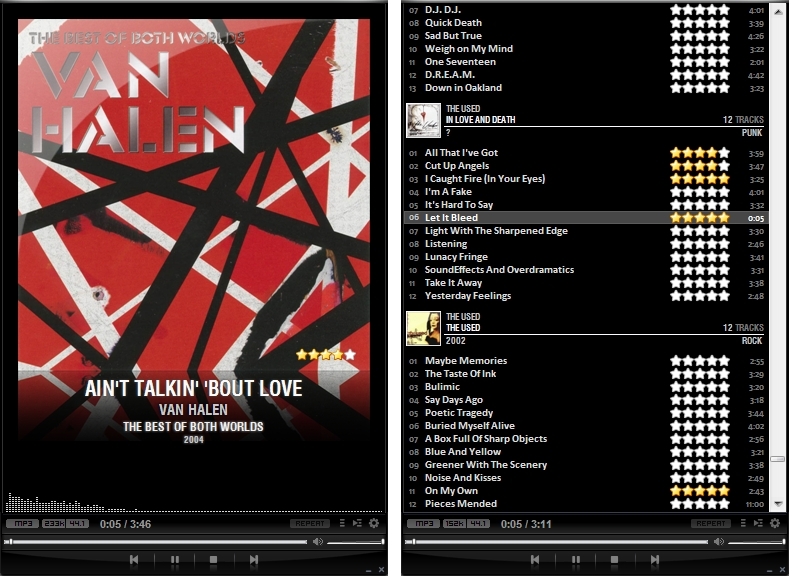 Menu: Improved navigation; quick links to mini now playing and ratings menu. Menu: Fb2k Main Menu button added on left for quick access. SCPL: Added support for Cover Art in Group Headers, option in Configuration panel: need to refresh playlist for changes to take effect! Now Playing: Top Margin dynamically changes based on window height, minimum margin declared in theme and can be turned off in options. 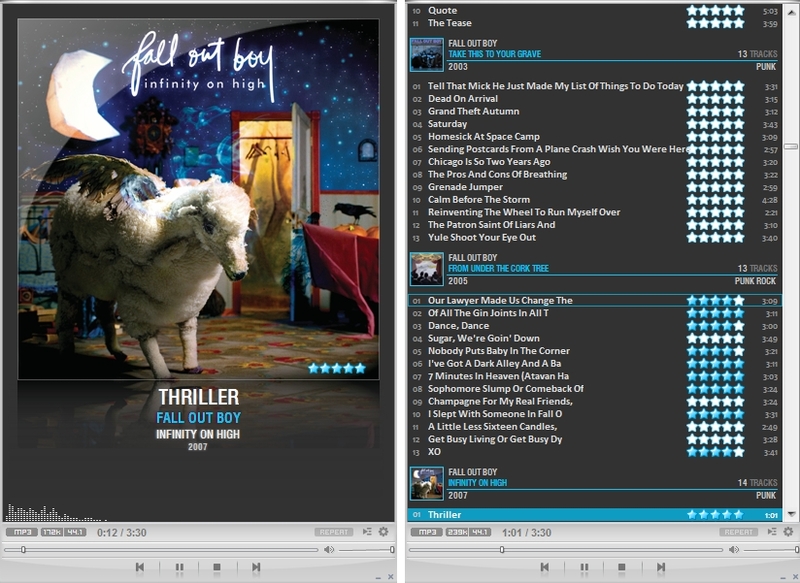 Now Playing: Artist Image shifts when space is tight (like text does). UPDATE: 0.7.1: Included Toggle SCPL Layouts, acts as it did in FofR v0.6. So, the pui file should be located in: C:\Program Files\foobar2000\PanelsUI\FofR Foobar Code Release v0.7\. From here the images should just work, without having to change a variable. For those that want to store the images elsewhere, the old installation method of modifying the PVAR “dir” to the appropriate directory still works. With this release I have obtained permission from a couple of component authors to include their work, so with v0.7 cwb_hooks, playlist tree and the album list components are all included to facilitate your installation. The biggest reason this layout was delayed is because of the sorting changes to PanelsUI. This new version uses the Default sort/group by criteria provided by PanelsUI v0.10. I’ve been struggling to employ the sorting/grouping system exactly how I want it so I have had to implement a work around. After installation, make sure that the 6th preset (i.e. on a fresh panelsUI install just make a new preset) is a “Sort/Group by Folder”. Otherwise some sorting methods will not work correctly. When sorted or grouped by folder the traditional SCPL mode that you are all familiar with will be shown. Otherwise Singles mode will be activated, and for sorting by Ratings or Title a slight modification with different group headers will be shown instead. Please give me some feedback about the sorting mechanisms. I’m still not entirely happy and I am open to new ideas. 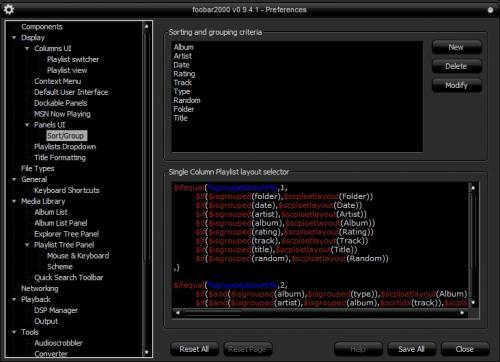 If you have previously installed PanelsUI v0.9 or greater then you will need to remove the component, open foobar2000 and select “DO NOT save settings”, close foobar, reinstall the NEW panelsUI and load up again, this way you will load the default sort/group by criteria and the appropriate presets. You will lose all of your custom criteria however. There’s a bug with Playlist Tree. First time you load it up LOAD IT IN COLUMNS UI OR DOCKABLE PANELS. This should avoid the error. Its a Panels/Playlist Tree incompatibility that I think is caused by the popup and can be avoided using this method. No menu images: click the triangle in the bottom RIGHT. This hides/shows the menu buttons. 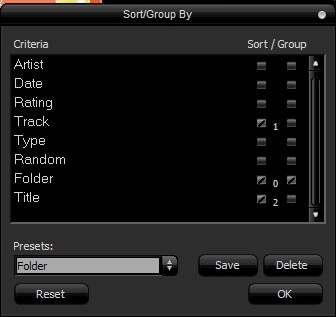 Right Click > Sort/Group By > Edit: Select Folder group/sort and any secondary sort ONLY things you want, save this as a new preset. If you have the PanelsUI defaults loaded then the SCPL layout selector will choose the Folder SCPL. 2. Copy cbw_hooks to components. 3. Create folder “PanelsUI” in main foo catalog. 4. Copy dawxxx666nextgen.pui to PanelsUI.